Amid the tumult of the Iowa Democratic primary, young but brilliant speechwriter Tom McAlindon meets Nathan Harris, the deputy campaign manager for an opposing candidate. Their acquaintance is strictly professional until an impetuous kiss on a cold winter night leads them into a secret romance. As their feelings deepen, both men struggle with the complications of keeping the relationship separate from their jobs and the inner workings of the campaigns. But in the nation’s most high-stakes political game, no secret is truly safe. When an observer realizes their connection, Tom and Nate discover that striving for the best of both worlds has a much higher cost than they bargained for… and that love can’t survive while Nate is hiding the truth from Tom. This is a book that revolves around politics, political campaigns, speech writing, presidential candidates, democratic candidates, and the love of two men that should not fall in love because of them being on the opposing ends of a democratic election. For me to be a person that does not like politics and I do what I have to in order to tune out anything revolving around politics I found that this was an amazing book. 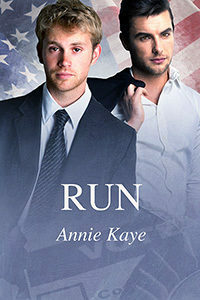 Annie Kaye did an amazing job of expressing just how things are run and how things work in the world of politics. She gave amazing insight into what was happening and made it very understandable to me, especially with me not being one for the debates and such when it is happening in real life. I am one that likes a brief overview of the ins and outs of the candidates policies and not one to set down and listen to the whole shabang. But after reading this book and now having a better understanding of the ins and outs of the political overview I have a greater understanding of how things work. As far as he characters, Nathan and Tom goes I just loved both of them. Again Annie did an amazing job because I was able to feel the emotions that both of these two men was feeling throughout the book. I felt the longing they had to be together. I felt their heartache when they broke up. I felt the happiness and how they completed one another when they were together. I felt the confusion they felt about their feelings. And of course I felt the love they had for each other whether they was together or apart. This is an amazing story that is about two men that are on opposing teams for the democratic candidates. They have so much standing in their way and they do what they can to keep what they have together under raps but as all secrets do, especially in the world of politics, secrets do not always remain secrets and someone gets hurt if not everyone involved. This is a tale that could be real even though it is not. It was an amazing story and I enjoyed every up and down moment through the book. Cannot wait to read more by Annie Kaye in the future. Annie Kaye’s first ‘real’ job was a career in insurance. After fourteen years, the industry had wrung from her everything it could, leaving her desperate for a change that would allow her to flex her long-dormant creativity. She left her job and took several months off, planning to spend them on the couch in her yoga pants. Not six weeks had elapsed before she’d rediscovered a long-lost love: putting words to paper. Since 2009 she has written almost a million words of fiction, each piece bearing a common theme: love and relationships between gay men. Balancing family, work, creative efforts, and community involvement – and trying to hit the gym once in a while – are all near the top of Annie’s to-do list. At her home in the woods of rural Ontario, Canada, she endeavours to carve out her writing space from amid the joyful noise created by her husband, their two children, one dog, one cat, and the woodpeckers who sharpen their beaks on her windowsills.